We proudly donate a portion of all proceeds to breast cancer charities. We base our quarterly donations on your nominations. We would love to hear about your favorite organization! Hayley Townley & Margerie Manning are both dynamic breast cancer survivors, diagnosed in their 30’s. Together they developed the There Is Life After book series and website which empowers breast cancer survivors and their loved ones. They can be seen around the country at various breast cancer & motivational conferences and are available for appearances and speaking engagements. Hayley & Margerie have proved beyond a shadow of a doubt that there is life after breast cancer! They share. They create. They inspire. They pay it forward. 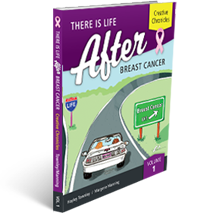 A portion of the proceeds of There Is Life After Breast Cancer books and products is destined for breast cancer organizations all over the country. I am the founder and creator of There Is Life After Breast Cancer. I live on the beautiful Central Coast of California with my awesome husband, Tim Townley, and our crew of furmonsters. In addition to being a tireless breast cancer advocate and speaker, I also own Comet Realty and am a co-founder of BreastCancerReconstructionChoices.com. I like to laugh, read, decorate, write, cook, travel, and drive my 1990 Mustang 5.0 convertible (pictured on the front of our There Is Life After Breast Cancer book) or my 1965 Comet station wagon. I pour my heart and soul into everything I do and live by exceptions, not rules! I also throw terrific parties. 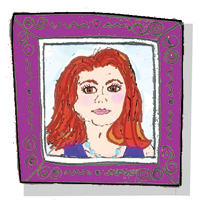 I am the illustrator for There Is Life After Breast Cancer. I don’t think breast cancer is the slightest bit funny, however, I discovered drawing cartoons about breast cancer was a good way to process the emotions of my experiences. 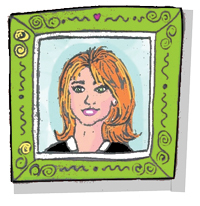 It was also my pleasure to illustrate the many wonderful contributors’ stories for our book series. Besides being a breast cancer survivor and a retired general dentist, I am married and have three children. I am a co-founder of BreastCancerReconstructionChoices.com and have served on several Congressionally Directed Medical Review Panels as a consumer advocate. I am an Amazon warrior and have a cat who hunts wigs.